Hello. Well here we are again. It is the month of love so I thought I would get inky again with a little love theme. These ducks were just the right thing to use for a bit of a fun tag. Crafty Individuals... Favourite Ducks. C1-373. Leonie Pujol... Lots of Texture. That's Crafty Dinky Stencil...tc093 and tc038. Ranger Archival Ink...Orange Blossom and Plum. Ranger Distress Ink... Abandoned Coral, Spiced Marmalade and Fired Brick. Cosmic Shimmer Glitter Jewels... Stars. I began with a piece of card slightly smaller than my usual measuring 4" x 7". I stamped the ducks with black ink slightly to the left of the card and stamped them again onto a piece of masking tape and cut out carefully. I placed this over my stamped image before blending over the Spiced Marmalade and Abandoned Coral. Once happy, stamp the wording in black. 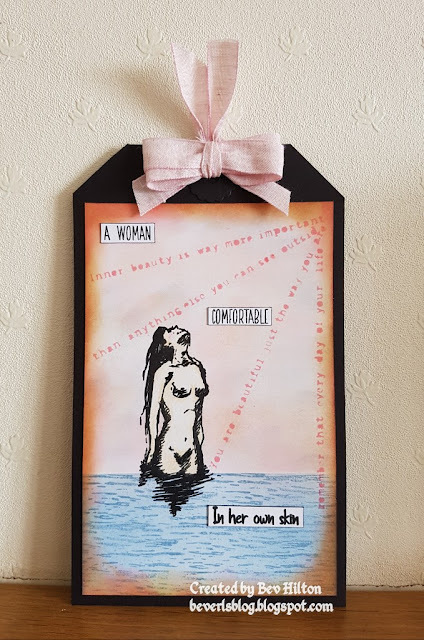 I didn't want the wording all together so I masked off the words 'your side' before inking so that those words were not stamped as I wanted them to the right of my ducks. Now do the same again masking off the words at the top so that only the words 'your side' are stamped to the right of the image. Take the dinky flower stencil and some wet paper towel and dab through the stencil to lift some of the ink in a few places. Take the heart stencil and blend through with the fired brick distress ink randomly. I did some lighter and some darker. Take the bar code stamp and stamp with black ink to ground the ducks. Now for some more background stamping. 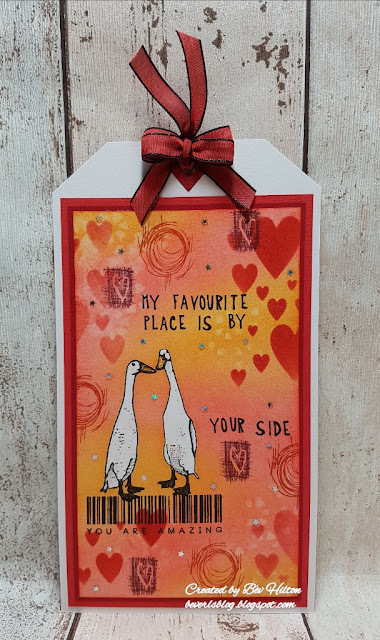 I just love this stamp set by Leonie. My favourite is the messy circles as I call them. Stamp these with the Orange Blossom randomly, making sure some are stamped off the card. Then take the textured love heart and stamp with the Plum ink randomly. Now happy with the background, remove the masking tape to reveal the ducks. I took two shades of grey pencils to very lightly colour the shaded areas and two shades of orange for the beaks. Mount onto some red card and again onto a lighter orange/red card. Now mount onto a piece of white card leaving an inch at the top. Cut off the corners and punch a hole. Die cut two red hearts and punch a hole in the middle to use as hole reinforcements, and glue over the hole. Thread through a piece of ribbon and then make a double bow and glue in place with a hot glue gun. All for now. Hope you all have a great week ahead.